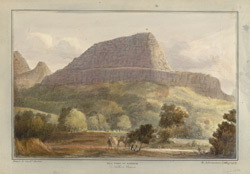 Coloured lithograph of the 'Hill Fort of Sidghur' in the Western Ghats in Maharashtra by Rudolph Ackermann (1764-1834) after an original drawing by Captain James Barton (1793-1829). Plate 2 of Captain James Barton's '12 Views of Hill Forts in the Western Ghats near Bombay' published in London c.1820. The Western Ghats are a range of hills that reach from the state of Maharashtra to Tamil Nadu and separate Bombay, on the western coast, from central India. This view shows a camel in front of a large outcrop of rock at Sidghur. The artist, Captain James Barton, was an artillery officer who served in the third Anglo-Maratha war in 1817-19.